Now that summer is upon us, my mind and stomach are turning towards luscious mangoes, juicy watermelon and cooling, fuss-free salads. 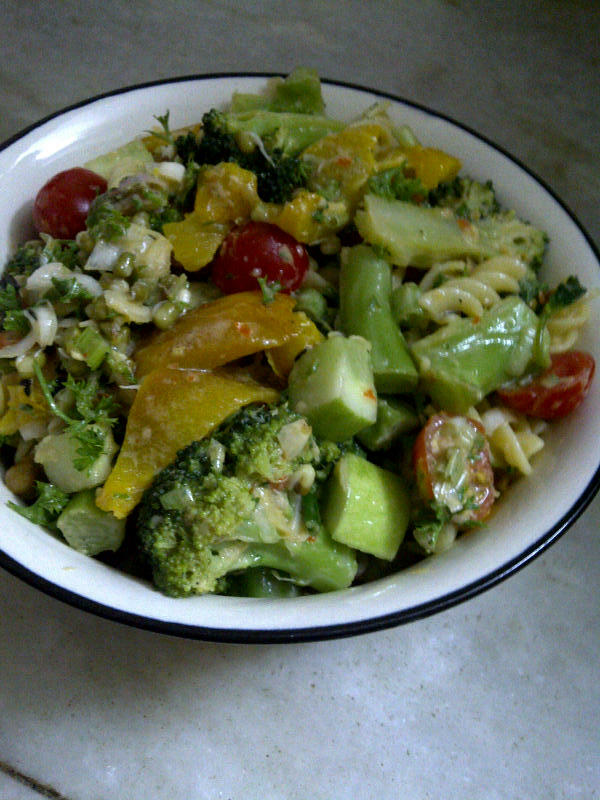 Here’s a pasta salad I made for last night’s dinner. A little bit of pasta can go a long way if you load it up with vegetables. By this, I mean that you get the satisfaction of having had pasta while bulking it with all the good stuff. You can use penne, farfale or any other chunky pasta of your choice. Boil the pasta with a pinch of salt and the stock cube according to instructions on the packet. Drain and put in a big bowl. To make the salad dressing, whisk together yoghurt, mustard, hot sauce, grated garlic, olive oil and salt to taste. Refrigerate till ready to use. Wash and finely chop the spring onion. Add it to the pasta bowl. Wash and halve the cherry tomato and throw them in the pasta bowl. Char-grill the pepper on the burner and let it cool down. Cover and keep aside, the steam helps loosen the skin. Once the pepper has cooled, remove the charred bits. Cut in half, remove the core and the stem and slice it. Add to the pasta bowl. Wash and dice the cucumber and add to the pasta bowl. Wash and chop the broccoli. Steam the broccoli and sprouts till tender but still with a bite (approximately 7 to 8 minutes). Add to the pasta bowl. Wash and chop the parsley and add to the pasta bowl. Now toss everything together, add the salad dressing and toss once again. Drizzle with the cider vinegar, mix well and serve. You can use any hot sauce of your choice. Use a strong mustard for a bit of zing. You can peel the cucumber if you wish, I prefer it with the skin on. If you like garlicky dressing, increase the number of garlic cloves. I have a double-decker steamer so saved time by boiling the pasta and steaming the broccoli and sprouts simultaneously. Our dog, Mr. Puck, loves dairy products. Ice cream in summer, cheese as an occasional treat, fresh cream off boiled milk, milk on its own and yoghurt – he really has a nose for the white stuff! Fortunately, he is a very lean and muscly dog who doesn’t have any weight issues so we don’t have to worry about him piling on the pounds. As for his overall taste in food, he is not fussy but – like us – he does like his meals freshly prepared. So, the way we cook for ourselves from scratch everyday, we do the same for him. It is not a big deal since his diet is very simple and what we make for him hardly takes any time. 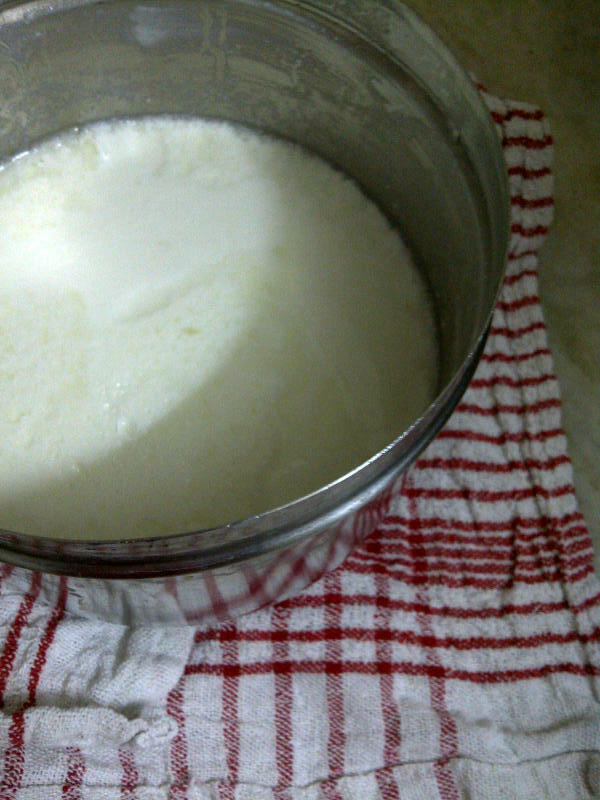 Thanks to Mr. Puck, I have learnt the art of making yoghurt at home. Since he has it daily, not only does it work out economical for us but it also means that he gets absolutely fresh, pure, yoghurt. Okay, I say this after a few years’ experience. And initially, the task seemed daunting to me and I did fail a good few times in the beginning. But persistence and perseverance paid off. So I would like to share with you my totally unscientific method of making yoghurt at home. You don’t need any fancy thermometer or gadgets. Just milk, a saucepan, a tablespoon of yoghurt culture and a stainless steel or plastic container with tight fitting lid. Making yoghurt at home hardly takes any time. Once you mix the hot milk and culture, you set it aside for several hours and it does its own thing. There is no cooking time as such. Once it reaches boiling point (it will start rising to the top), take it off the stove and leave it alone for 18 to 20 minutes. Don’t leave it for longer than 20 minutes. After this time, dip your finger in the milk to see how warm it is. You don’t want it so hot that you go “ouch”. Nor do you want it lukewarm (this is why I suggest not to leave it for more than 20 minutes). You want the milk to be hot enough. This comes with a bit of trial and error. In my case, the 18 minute timing works perfectly. Now add the 1 tablespoon of live yoghurt to the container in which you will be setting the yoghurt. Whisk it around with the spoon so that it breaks down and is nice and creamy. Add the hot milk to the yoghurt culture and stir well. Cover with a tight fitting lid and set aside in a warm place (like near a radiator or an oven which is switched off) for about 8 hours or overnight. After 8 hours (or the next morning), open the lid to see whether the yoghurt is set. If so, refrigerate. If not, leave it for a couple of hours more. In hot weather or during the summer months, the yoghurt sets faster (say within 4 to 5 hours).